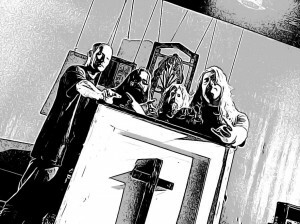 Hailing from Indianapolis, Indiana, Apostle Of Solitude was formed in 2004 and have always been a solid doom act. Their brand of a more traditional doom sound was first brought to my attention with their last record, Last Sunrise from 2010. 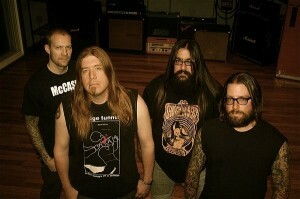 Finally, after four years the band is back with their newest release, Of Woe and Wounds. The album itself is very solid, and Apostle of Solitude are a very capable band. However, much like their last release, there are some forgettable moments and the overall length of the record does hinder it a bit. Regardless of a few flaws though, Apostle of Solitude are hitting their stride and showing that they do deserve a spot in the doom genre. The album starts off with a very melancholic sounding instrumental intro. Something like this can be hit or miss as an intro track should help draw in the listener, and let them anticipate what is coming. Apostle of Solitude succeeded greatly at this, and once the second track “Blackest of Times” hits the speakers there is no stopping. The pace of the record is usually more mid-paced, but the band does take the time to slow down here and there. These slower sections are a great way to hear the bands two guitar harmonies and riff attacks. The drumming in undeniably doom, and the bass is thick and adds an extra punch to the sound. While the band plays a traditional style of doom; there is no doubt the band has their eyes set on the present and future and their sound really helps solidify that fact. Vocally, guitarist and singer Chuck Brown has a commanding performance; stealing the show whenever his voice appears. “Die Vicar Die” and “Whore’s Wings” serve as prime examples of his vocal ability and are among the best tracks on the record. Sung entirely clean and mid range, Chuck is able to get a different register when needed but his normal voice fits the music perfectly and really adds to the downtrodden feeling of the genre. Going back to the guitars, Chuck and second guitarist Steve Janiak play off one another extremely well. The album is of course heavily riff based, and the duo have come up with some truly heavy and wonderful riffs. Not every one is a hit, and some songs do seem more forgettable than others, but next to the vocals the guitars are a real high point on this album. Those solos throughout the record are incredible, and “Luna” and the aforementioned “Die Vicar Die” are the real highlights. Apostle of Solitude took four years in between records and it is easy to see the time was well spent. The being said, the last part of the album does seem to go on a little too long. The album has long tracks throughout, but near the end of the record it does begin to drag a bit on a couple of songs. “Luna” helps bring the interest level back though and the reprise of the intro track closes the album on a great note; bringing everything full circle. When listening to this record, I was a little upset that there was not a song that stood out to me the way “December Drives Me To Tears” did off their last record. However, that is probably the only track I go back and listen to from that record with any real consistency. As it stands now, Of Woe and Wounds has gotten multiple spins and will continue to do so. To me, that shows the overall progression and advancement the band made with these new record. The song writing is stronger overall, and even with a few tracks being somewhat forgettable the album overall is very formidable. 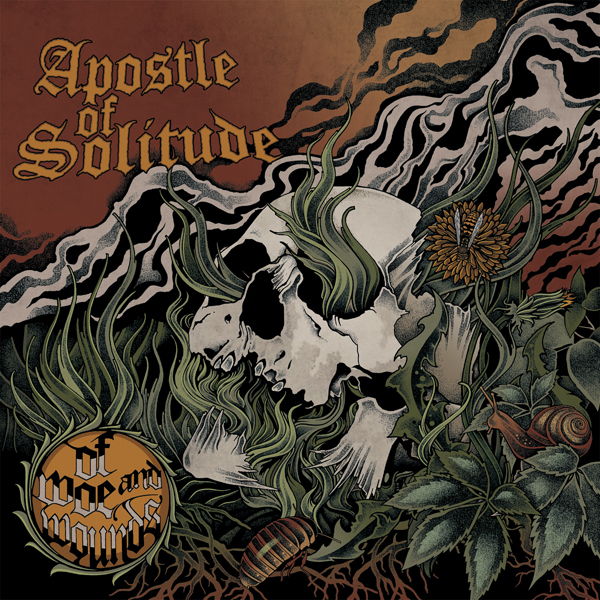 2014 has been an impressive year for doom metal, and I can only hope Apostle of Solitude do not get lost in the shuffle as this is a great record and deserving of any attention it can get. This entry was posted in Reviews and tagged 2014, Apostle Of Solitude, black sabbath, Chuck Brown, Cruz Del Sur Music, Die Vicar Die, doom, Gates Of Slumber, Hour of 13, Indiana, Indianapolis, Last Sunrise, Luna, Of Woe and Wounds, Orange Goblin, Profound Lore Records, Steve Janiak, traditional, whore's wings.